goodness! that's all i have to say. good. ness. i almost cheered when the radio announcer on my morning radio station announced that he's not going to talk about the swine flu just because firstly, everyone else is more than covering it, and secondly, it's getting a little too much hype from people who don't know what they're talking about. epidemiologists and molecular biologists have said that, although it'll get worse before it gets better, this likely isn't gonna turn into any spanish flu pandemic. i'll take their word over any reporter, any day. furthermore, i haven't heard any mention of the fact that mexico city is an incredibly densely populated area with less health care than what we've got in the states and canada (not to mention the many, many other differences between the countries). it sounds insensitive, but i'm pretty confident with the fact that our health care systems can handle it. c'mon everyone - let's give the poor pigs a break. I have a Kreativ Blog Award waiting for you on my blog! Thank-you!!! I was beginning to think everyone was going crazy!! I'm feeling for the pigs myself - it's not their fault! I'm all for calling it the "little piggy flu" too!! Great suggestion! Really nice post! Glad I "caught" it!! I am so with you! 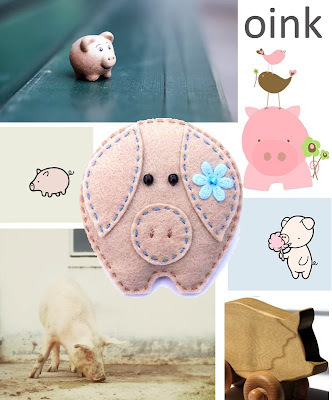 Love the little piggy collage.